The Operating Log Unloading Car No. 3461 would unload logs into the line side bin with the use of a No. 6019 or UCS track section. Variation A: Has rubber-stamped sans-serif lettering. Most likely production began before the heat stamp was available. Came with staple-end trucks and five unstained wood logs. Produced early in 1949, this is a rare variation. Variation B: Has heat-stamped sans-serif lettering. Came with both staple-end or bar-end trucks, and five unstained wood logs. This variation was produced from 1949 until 1953 and is the most common. Variation C: Has heat-stamped sans-serif lettering on a GREEN painted car. 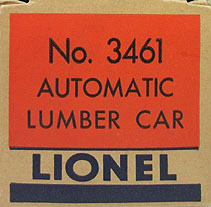 Produced in 1954-55, this car was the first have the five stained logs that became the standard load for all flat cars that came with logs. Has bar-end trucks with magnetic couplers and came in a box numbered 3461-25. This number does not appear on the car or in the catalogs and is only shown on the box end. On all of these variations those cars that came in a train set have the number 3461X on a smaller box that did not include the No. 160 Unloading Bin that was packaged separately within the set.